Cold December rains, muddy water and jump fisherman kept me off the water most of the month so I concentrated most of my time in the woods. Here are a few nice deer that were taken within a few miles of my house. My 4 year old grandson and I with one of the bucks we took this year, 21 1/2 inch inside spread, hopefully next year he will be squeezing the trigger. Eighteen point Buck harvested by Jason Life after jumping the deer out of its bed. 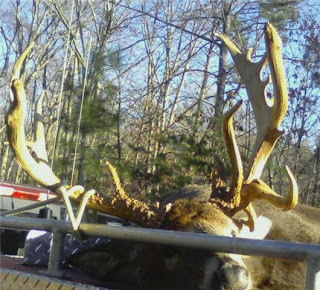 B+R Buck...This monster had been seen by dozens of hunters for months in the vicinity of B+R market and thousands of hours had been put in by hunters trying to take this wonderful trophy. Chip Fletcher grunted this trophy to his stand. The next two pictures are of Wendell Seay, he harvested these two beautiful deer in the same piece of woods. Greg Whitlock called me one morning panting "I just shot the big one!" He had seen this deer two days in a row, had an opportunity to take it the day before but did not take the shot. His persistence payed off the next morning harvesting this Buck. This deer was huge, the heaviest deer that I saw this season! Finally Tim Clarks Buck. I had seen this deer along with another very nice Buck 2 days prior to Tim taking this big Buck. He shot the deer across a large creek with slim hopes of finding the deer but a good friends tracking ability payed off with this beautiful trophy. Could not have happened to a nicer guy. Congratulations to everyone this hunting season, here is a little proof that if you let the small ones Go, they will Grow.